Newsifact: Steele under fire for new GOP ad. 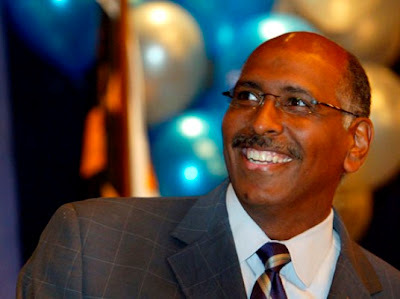 Embattled GOP chairman Michael Steele is again under fire for a new Republican Party ad campaign, which critics have described as disgusting and utterly inappropriate. The poster ad, which was unveiled yesterday, appears to have sourced a widely-circulated "bad painting" of President Barack Obama (see badpaintingsofbarackobama.com) to make its point. 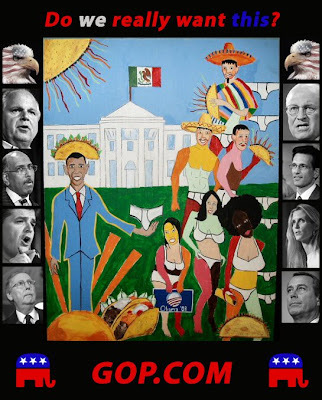 The painting in question shows Obama surrounded by Mexican tacos, against the backdrop of a White House adorned with the Mexican flag and also shows the president being adored by a strange mix of multi-colored, in some cases satanic-looking figures. Perhaps most curiously, the ad also features an array of underwear, including one pair in the president's hand. Critics have lashed out at the ad, arguing that it is filled with unsettling and inappropriate undertones. However, Mr Steele has defended the ad, stating "I think both the painting and the ad perfectly embody the message that the new GOP is trying to convey. I think it has a very powerful message."